Alaska Native Tannery Is Bringing Seal Back Federal regulations largely put an end to the luxury trade in seal pelts decades ago, but a reopened tannery in Alaska has created a new market for sealskin garments made by Alaska Natives. A basketball hoop stands near boats buried in the winter snow. 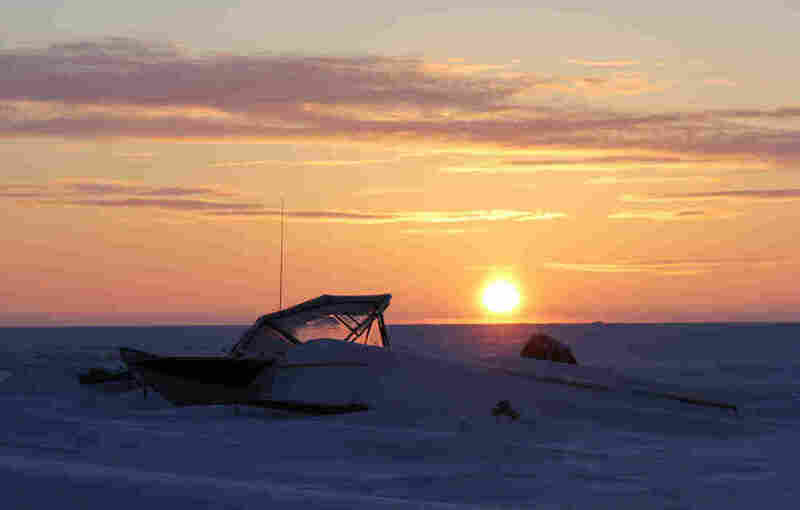 Shishmaref, Alaska, is just a few dozen miles below the Arctic Circle, and in the depths of winter the sun rises close to noon. Sealskin used to be a luxury item across the U.S. and Europe, a midcentury status symbol featured in ritzy fashion shows. For decades, fur merchants would trade cash for full pelts, buying stacks of them at a time from Alaska Native hunters. Then in 1972, the Marine Mammal Protection Act put an end to that. Under the law, wildlife products from sea mammals have to be artistically modified before they can be bought or sold among nonnative people. The market for raw walrus tusks, strips of whale baleen, and full seal hides went away overnight, replaced with a highly regulated marketplace for crafted goods. 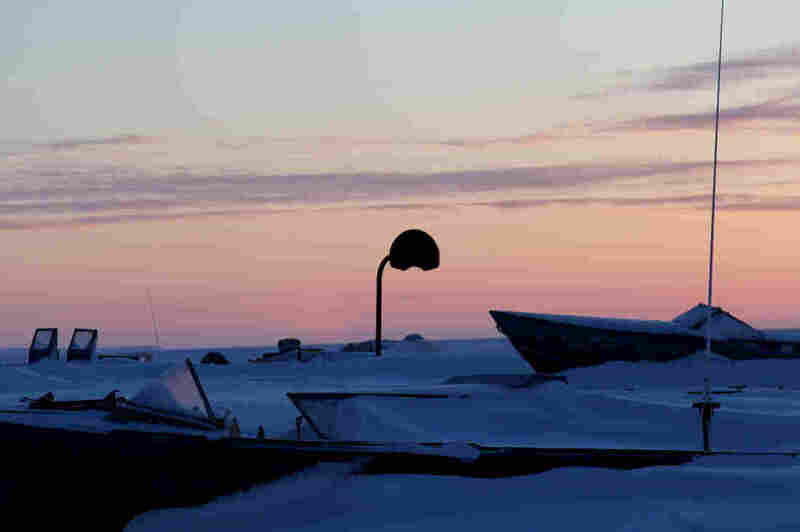 But in the tiny town of Shishmaref, Alaska, with a population of just over 600, a small business is changing that: a seal tannery. Finished sealskin is a dark gray flecked with black, sleek and shimmering in a way that makes it look almost animated. To the touch, it's both soft and firm, like the outer hairs on a German shepherd. It is used in thick outer garments like hats, mittens and boots because of its prowess as insulation from cold, which many say is still unmatched by industrially produced fabrics. Cordelia Kellie showing off her sealskin gloves, made by a woman from Shishmaref and purchased at a dance festival. Cordelia Kellie is Inupiaq, with family roots in far northern Alaska. She works reviving indigenous language and culture, a job that takes her to small Arctic communities across the state. And when she goes, she brings the pair of sealskin gloves ringed at the wrist with black beaver fur that she bought from a woman at a dance festival. "I asked her where she got the seal, because oftentimes when you ask that question it can come from a father, or an uncle, or a cousin," Kellie recalls. "She said, 'I killed it!' "
Caribou hides hang behind a home in Shishmaref. The community relies on subsistence hunting, including both terrestrial and marine mammals, alongside birds, fish and wild vegetation. 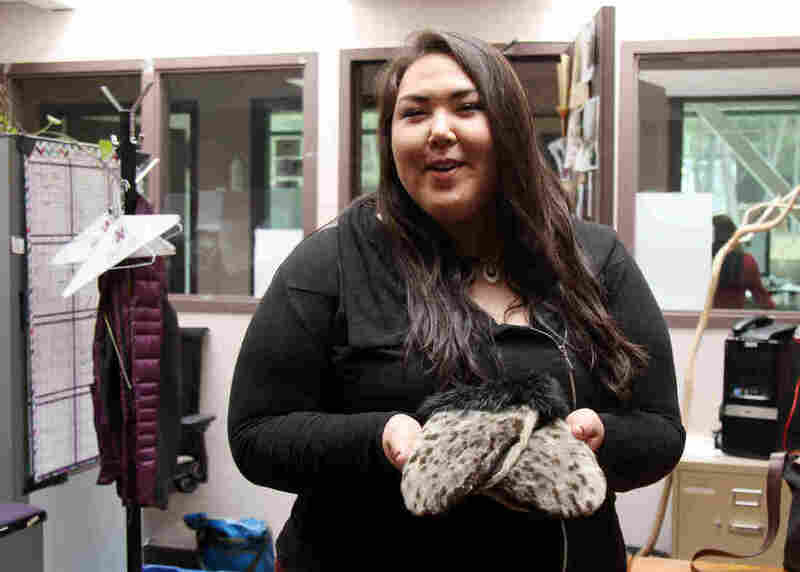 In Alaska and across other parts of the circumpolar north, sealskin is showing up in more places: barrettes, keychains, even high-heeled shoes and lingerie. Kellie says there is a sartorial politics at play, because the distinctive mottled sheen signals indigenous heritage. "It definitely communicates that you're likely from the northern part of the state," she says. In Shishmaref, Percy Nayokpuk, owner of the Nayokpuk General Store, will sell you sealskin house slippers for a few hundred dollars. "This is good slippers for up north, I tell you," Nayokpuk says, holding up a gray slip-on shoe accented with blue beadwork. "Don't get no Crocs if you're gonna live around here. Get a pair of these." There are several of them lined up casually on a shelf, mostly on the chance a visitor will buy a pair. Generally, sealskin garments are sold at shops and galleries in Alaska's bigger communities, as well as at large craft fairs. There's also a robust marketplace on Facebook. Across Alaska, Shishmaref has a reputation for having some of the finest traditional crafts, everything from sealskin hats to carved walrus ivory jewelry. The notoriety is due in part to an innovative business strategy the community's leaders set up to leverage local talent. 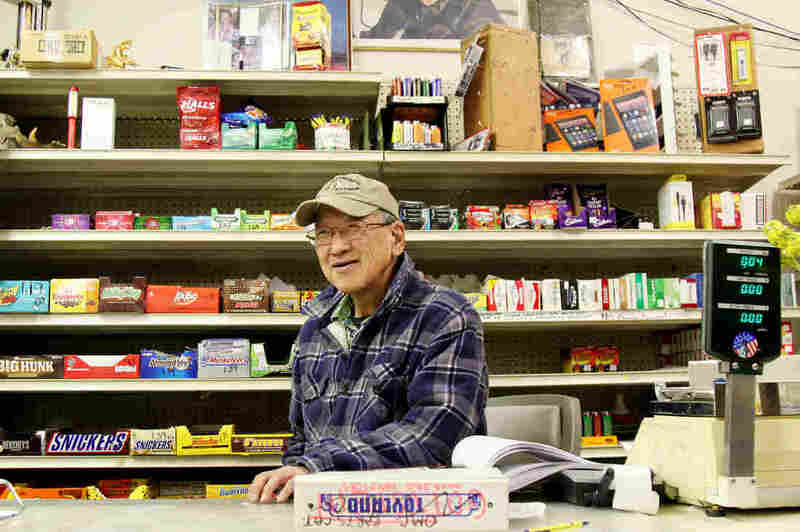 Percy Nayokpuk behind the counter at the Nayokpuk General Store, which his father opened in 1960. 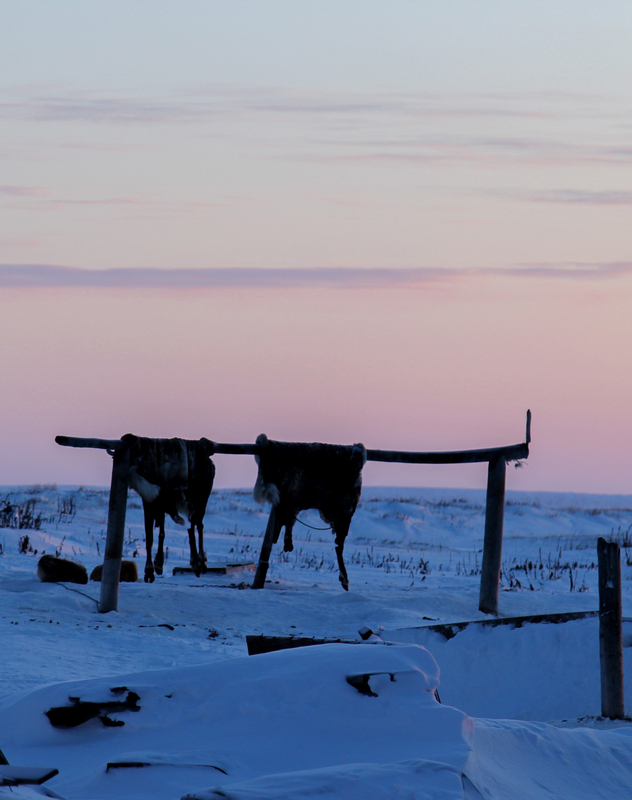 In the 1980s, Shishmaref's governing council helped establish the local tannery as a link between indigenous hunters and potential fur customers. The original business tanned a wide variety of hides, and in addition to selling finished pelts back to customers it also employed locals to sew garments sold out of stores and showrooms all over the state. Tony Weyiouanna, who took over managing the tannery in 1991, says for years the business was an economic engine, handling hides from across the state and bringing in hundreds of thousands of dollars, much of which stayed in Shishmaref. "It made an impact," Weyiouanna says at his office in Nome, the hub town for small communities like Shishmaref in the Bering Strait region. But it was never an easy business to keep running. Weyiouanna left the tannery in 1995 and wasn't keeping tabs more than a decade later when things got rocky. Splatter from the hides kicked off the fleshing saws onto the wall that wasn't cleaned up in time before the tannery closed for the season in early January. In October, the Shishmaref Tannery reopened for an abbreviated season. By most measures, it was a success. The business handled about 850 seals and made back just about all the money the local governing council put into restarting it, according to manager Dennis Sinnok. "They come in and drop the seals off here," Sinnok says during a tour of the tannery building. 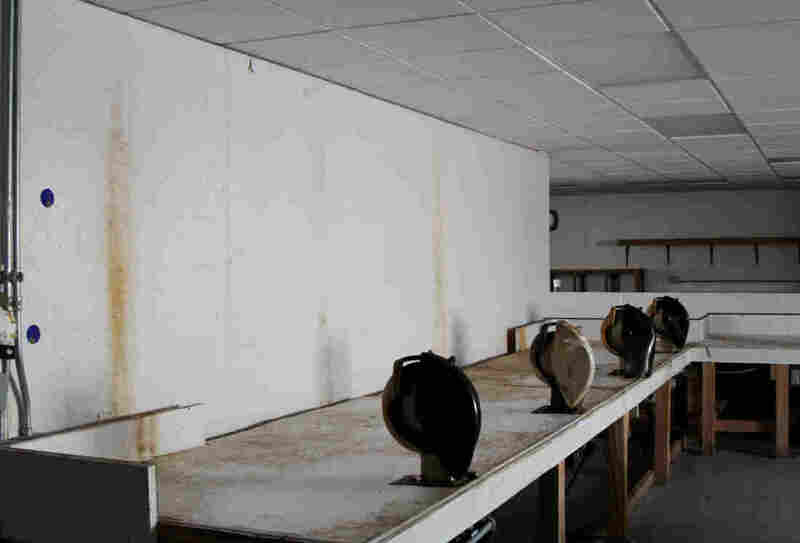 Though it has been cleared of equipment and washed down, he is standing in front of worktables and large brining tanks where pelts soak after they've been invoiced. "These are fleshing machines," Sinnok explains nonchalantly of what look like several circular saws. "[They flesh] the fat right off of the seal." Currently, this is the only business of its kind in Alaska. And this past season there was so much pent-up demand for tanning services that Sinnok had to set limits on how many hides each family could bring in. It was capped at 10. Shishmaref Tannery from the outside. 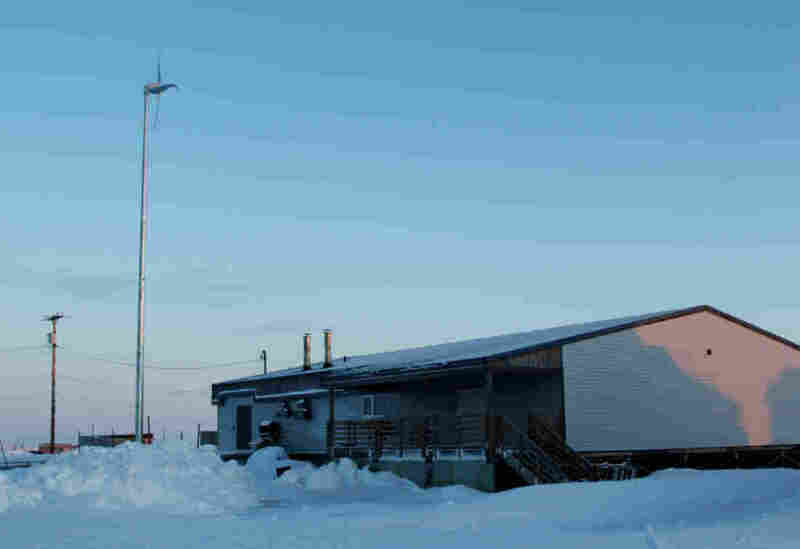 A small wind turbine beside it adds supplemental power, which slightly lessens the high fuel costs of keeping the building warm during the short three-month season it is operating. Part of Sinnok's job is keeping operations from growing too big. The short season, family limits, and a service that is limited almost exclusively to seal hides — all of them are measures to keep the tannery from overcommitting. And that is due in part to how hard it remains running a business in rural Alaska. There's a lack of basic infrastructure, and sky-high costs for things like food and fuel. Most buildings in Shishmaref lack indoor plumbing. At the general store, a gallon of drinking water costs $11. Sinnok hauls water for the hides to brine using a tank attached to his four-wheeler, schlepping back and forth between the tannery and a nearby spigot. In spite of the challenges, though, Sinnok is optimistic the business can survive. Boats buried in snow toward the edge of the lagoon at sunrise. "Hopefully somebody can see what I see," Sinnok says. Even if he is not in charge of operations, he wants the tannery to stay in business "to keep people sewing. Ya know, keeping the tradition going: making crafts out of seal." Sinook's hope is to connect the town's indigenous heritage to its economic future. A previous photo caption incorrectly referred to seal meat hanging on a drying rack. It is actually caribou hides.